I seem to have damaged a fetlock or something. During the epic tennis victory on Wednesday evening, In the hubris if victory, I did not notice a nagging pain behind my knee, (although I do have experience of a nagging pain in a different context occasionally) until yesterday morning when stumbling from my bed. 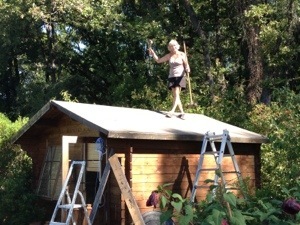 It was just before 11am, so bright and early then, and with walking in that heat not a good idea, instead I helped That Nice Lady Decorator to put new roofing felt on the Love Shack, the chalet in our garden. By helping, I mean shouting encouragement and useless instructions from the garden whilst she, hammer in hand, did what she felt was necessary. I think I captured the situation perfectly today for posterity. Being still unseasonably hot, after lunch, I took once again to my pit for a siesta, dreaming of more tennis triumphs. Even if I play in a wheelchair I know I can beat Currencies Direct affiliate Dancing Greg Harris, and have agreed to play again this morning, whatever state I am in. This will be the inevitable precursor to what may be one of the penultimate Friday post tennis lunches at Auberge St Donat this summer. Penultimate, I hear you ask? Well, next Friday I shall be amidst a Grimm fairy tale, staying in a turreted room where Sleeping Beauty was reputedly held before being rescued by her prince. I have my own thoughts as to why That Nice Lady Decorator wants to do this, but will keep my powder dry for the trip visit next week. Then in the last week of September we shall be cruising along the Amalfi coast in Italy, courtesy of Roly and Poly Bufton, aboard their splendid yacht Sea Breezes. That will leave just the 20th September as an available Friday before we shall almost certainly be heading back to the delights of an English winter in Arundel. Thus today must be, and will be enjoyed to the maximum. Last night, fresh from her “success” in creating “beer can chicken” earlier in the week on the barbecue, I was threatened with being treated to another experiment along the same lines; Guinness Can chicken. She must have something against chickens, forever wanting to stuff beer cans up their arses, I mean what about a duck or a turkey? I am also concerned that she may develop a similar strategy for errant husbands. Anyway once the heat had abated (but clearly not for the poor chicken!) we decided on an early evening walk and a swift beer at the Victoria Golf Club. It was closed. So with Leffe on draught, we popped into the self same Auberge St Donat, the idea being that if I were able to persuade her to spend an hour or so there, it would be too late for the intended beer can antics and I would be spared the chicken scenario. It would also be good news for the chicken. The plan worked a treat, and we arrived home too late for chicken abuse and settled instead for left overs for supper. We then adjourned to the pav for a late night de brief and a cigar. My life is about as good as it can get. Please wish me well. As an invalid, close to immobility due to that strained fetlock, I may have to allow Blind Lemon to deputise on the tennis court for me this morning, I will decide shortly, At least I have my new Adidas sports sunglasses courtesy of old pal Ben Adidas Dobson who was staying earlier in the week. At least I will be ok as long as the super glue sticks like it should. I am crap with decent sunglasses. “I am crap with decent sunglasses.” — among other things, it should be said !